Are you looking for some unique and delicious keto chicken recipes? 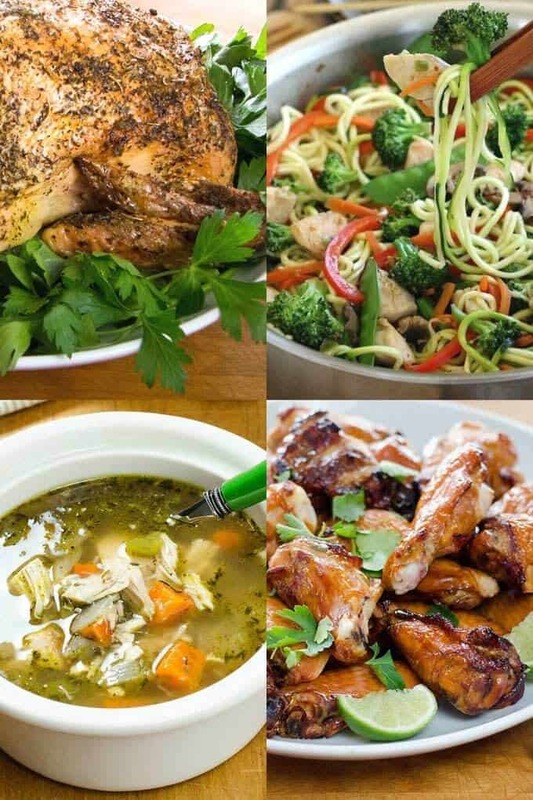 Here are 24 wonderful low-carb, gluten-free, paleo and keto chicken recipes you can enjoy tonight! These recipes are easy, flavorful and yummy takes on everyone’s favorite meat: chicken. Everybody loves chicken! It’s so versatile and easy to work with. Best of all, chicken is healthy and high in protein. There are so many delicious keto chicken recipes it’s hard to narrow down the choices. Dress it up or down—chicken is the perfect start for almost any meal. Look for chicken that’s organic and free of antibiotics and hormones. In many markets, it’s easy to find and reasonably priced. You can even find organic chicken breasts in the freezer section of the grocery store. Of course, you aren’t limited to only chicken breasts or thighs. Whole chicken and bone-in chicken cuts are often cheaper, and with several of these recipes, you can use the whole bird. Nothing goes to waste! 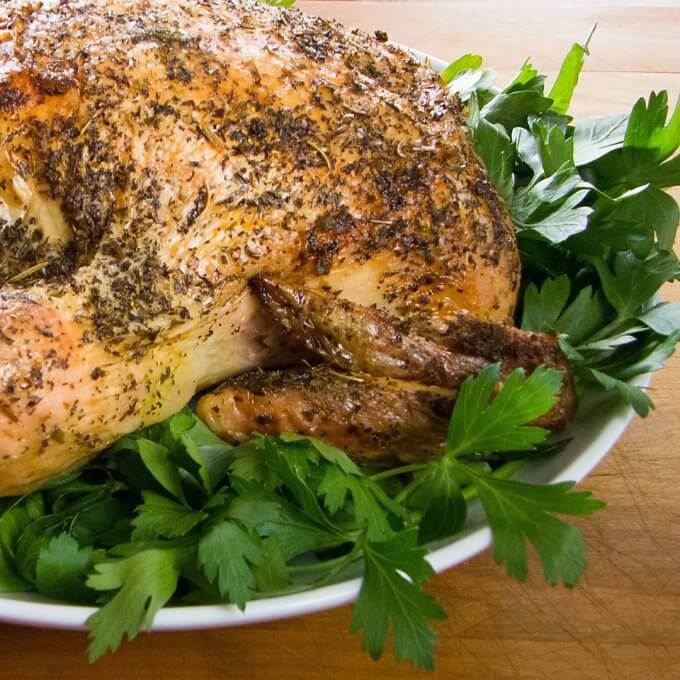 Roast a whole chicken in the crockpot, enjoy it for dinner one night, then pull the meat from the bone and enjoy it in a chicken salad for lunch. Use the carcass to create delicious and flavorful chicken broth that will be a perfect base for soups and stews down the road. With chicken, it’s easy to use it all! Of course, if you prefer the easy route, there are plenty of recipes for boneless, skinless chicken as well. Chicken wings and even ground chicken recipes are here too. All of these recipes are keto and paleo friendly, making it simple to decide on a healthy, low-carb, high-protein lunch or dinner option. 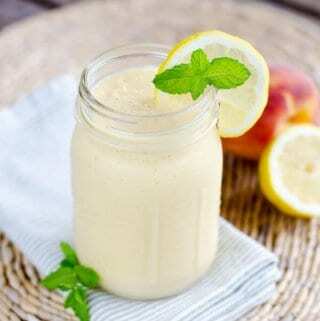 These recipes are also free of dairy, soy, gluten and other common allergens—just whole, healthy, simple foods. So if you’re wondering what’s for dinner tonight, put chicken on the menu! 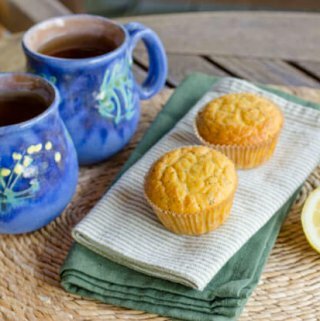 With these yummy recipes, you won’t be sorry! If you’re looking for a classic, slow cooker chicken soup recipe, this is it. 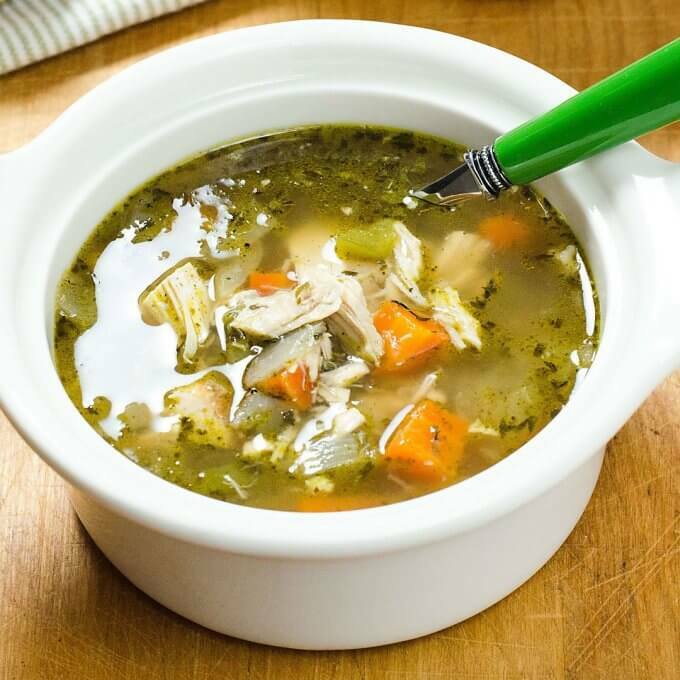 This paleo crock pot chicken soup is low-carb and keto friendly. The soup slowly simmers in your crock pot all day, filling your kitchen with a delicious aroma. This is a perfect food for cold winter days when you need a warm and filling dish. Of course, the crock pot preparation makes summer cooking simple, without standing over a hot stove or firing up your oven. This is a year-round excellent, keto chicken recipe. Is there a more classic chicken dinner recipe than chicken soup? It’s the go-to favorite whenever someone needs comfort food, is feeling ill or needs a fast but satisfying meal. 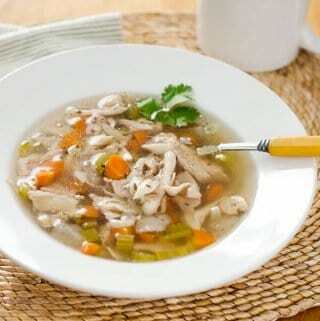 This fresh chicken soup recipe is made with pre-cooked chicken, so it’s ready in a hurry. It’s so fast and so good. Chicken stock in the can is full of additives, sodium and other ingredients that aren’t so great. Plus, making your own chicken stock or bone broth is an extremely economical way to cut your grocery costs. This stock is used as a base for all sorts of soups, stews and as a flavorful cooking liquid for vegetables. Once you see how simple it is to make crock pot chicken stock, you’ll wonder why you’d ever want to buy the canned version. Looking for a simple, flavorful and juicy keto chicken wing recipe? Try crispy smoked chicken wings! The crispiness comes from the grill and the smoky flavor can’t be beat. These are so easy to make and a perfect option if you’re looking for a different, less-spicy chicken wing. These are even better if you use an electric smoker, but they’re also great when smoked with wood chips on the grill. 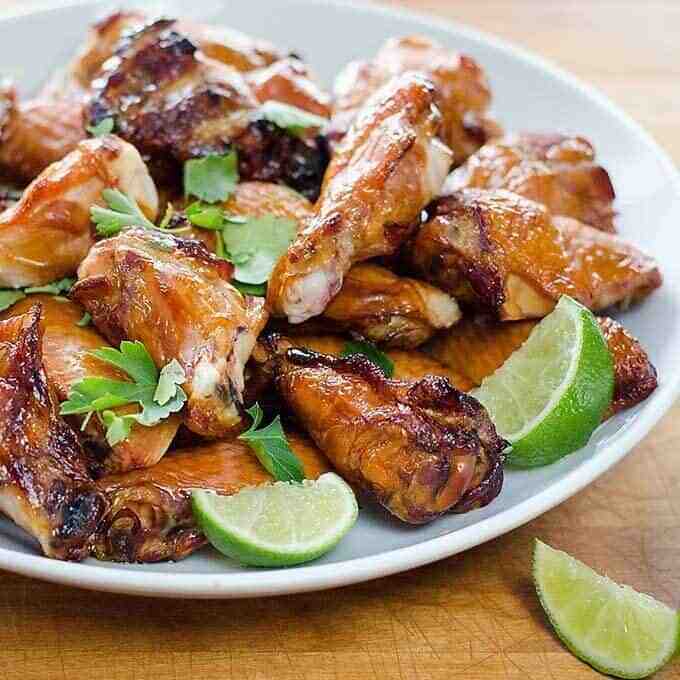 Another take on chicken wings, these crispy ginger lime wings are baked. The ginger lime sauce is a different combination of ingredient including dill, turmeric, ginger and apple cider vinegar. Addictive! These wings are paleo, keto and even Whole30 friendly, using fresh, whole ingredients that are healthy for you (and delicious)! I love new takes on chicken wings. It’s fun to make several different types to serve at a party or gathering. Wings are fun finger foods for game day, too. These tandoori wings with mint chutney are such an unexpected riff on chicken wings. Mint is one of my favorite herbs and I love incorporating it in a different way, like with this chutney. These keto paleo chicken fritters are a fun version of shawarma, a Levantine street food. Typically, shawarma is served with sauces, pickled vegetables or over lettuce. This fritter recipe uses diced chicken to create dippable patties that are a perfect change of pace. Chicken satay is a crowd-pleaser. This low-carb, keto and paleo-friendly recipe uses almond butter and coconut milk to create a yummy, flavorful version of classic satay. 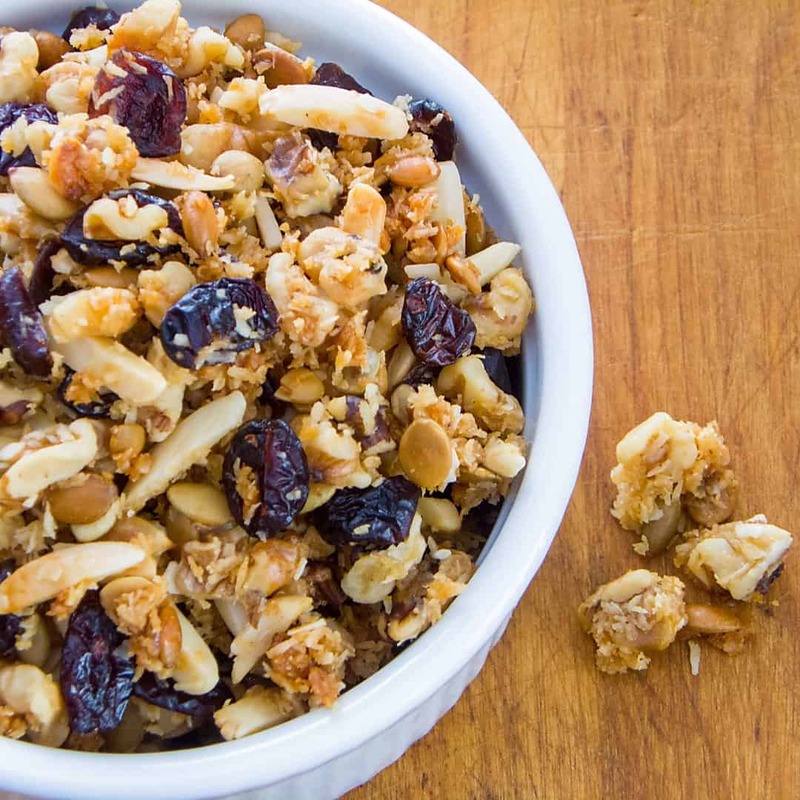 Add crunch by topping the dish with a few chopped almonds. This saucy chicken will become a company favorite. It’s a great recipe for a party or buffet too. Sometimes you need a basic roast chicken. This classic lemon and garlic keto chicken recipe includes instructions on how to roast a whole chicken, easily. 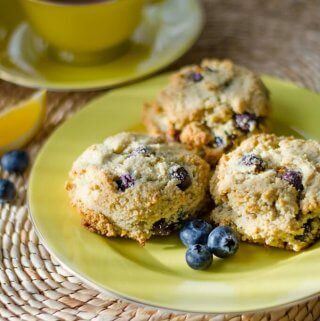 This is a fool-proof recipe you’ll love. It’s one of those impressive dishes you’ll love to serve for a special meal or enjoy on a weekend (but you’ll be amazed at how easy it is to roast a chicken in your oven). So many people wonder how to cook a whole chicken in a crock pot. Let me tell you, it’s actually pretty simple—and the results are absolutely amazing. This is hands down one of my favorite meals to prepare because it's juicy, tastes great and it’s so easy thanks to the crock pot. This recipe will yield plenty of leftovers to enjoy atop salads or for lunches throughout the week. If you want to learn how to make a whole bird in a slow cooker, this is a simple, starter keto chicken recipe. Those rotisserie chickens you see in the grocery store smell incredible. 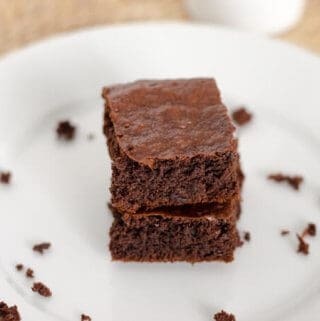 They’re always packed with flavor, moist and delicious. Plus, the chickens provide plenty of leftovers. Unfortunately, grocery store rotisserie chicken is often not organic, and some are marinated with soy. This take on chicken has all the flavors of those yummy rotisserie birds, but you’ll know exactly what ingredients are used. Better still, this dish comes together in your crockpot, so you put it in and go. 4-8 hours later, you’ll enjoy a delicious meal! Stir fry is an easy way to fill your plate with vegetables and protein. 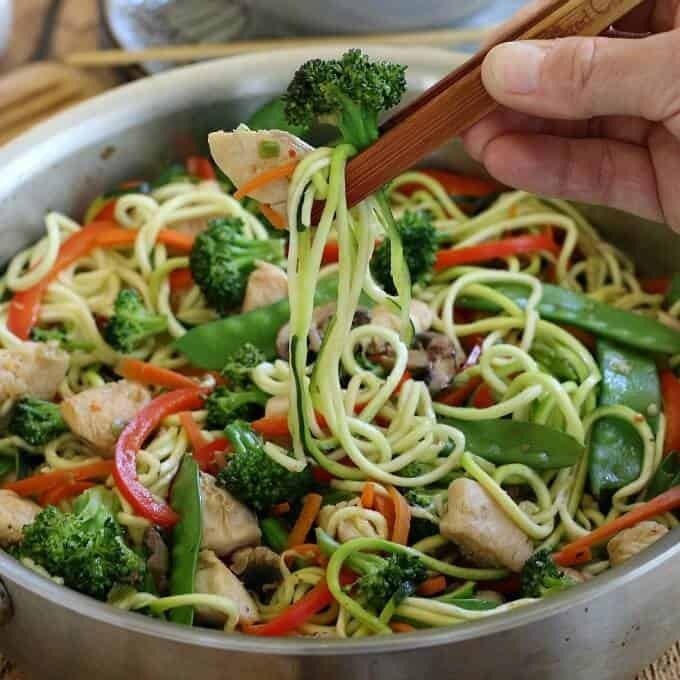 Using zoodles (zucchini noodles) to means this keto chicken recipe is fun too—everybody enjoys noodles and zucchini noodles are gluten-free and delightful. If you’re wondering how to make zoodles, check out my zucchini pasta tutorial. It’s easy and you get so many keto-friendly noodles out of one zucchini. Butter chicken is a savory, decadent Indian dish. Don’t let the name fool you, this dish is dairy-free, with the exception of keto and paleo-friendly ghee. The meatballs are made from ground chicken and then covered in a creamy, flavorful sauce featuring cinnamon, turmeric, and ginger. If you’re looking for a different, exciting chicken recipe this is a good one to check out. A different take on chicken meatballs, these creamy coconut meatballs from I Heart Umami will fill you up. Cooked in a savory coconut broth with basil, ginger, fish sauce and Thai curry paste, the meatballs are really unique. The sauce is creamy thanks to the coconut, but the recipe is dairy-free, gluten-free, paleo and keto friendly. This yummy chicken fajita bowl is made with cauliflower rice, one of my favorite keto-friendly ways to bulk up a meal. Cauliflower is so versatile and easy. You’ll be shocked and how well the veggie mimics the flavor and texture of rice. Check out this guide on how to make cauliflower rice, if you’ve never tried it before. This easy keto friendly chicken salad is an excellent recipe on days when you’re craving a little kick! The jalapenos add just enough spice to the mix and it’s a different take on chicken salad you’re sure to enjoy. 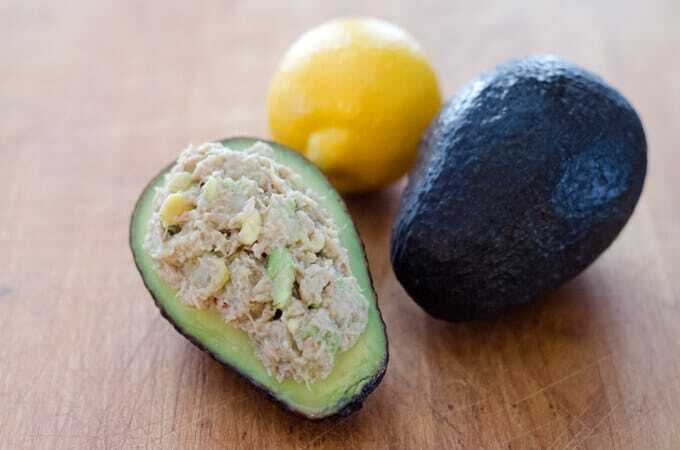 Make this with paleo and keto friendly mayonnaise. If you’re looking for a mayo recipe, here is my go-to formula for mayonnaise. It’s perfect on burgers, in salads (and on pretty much any dish)! 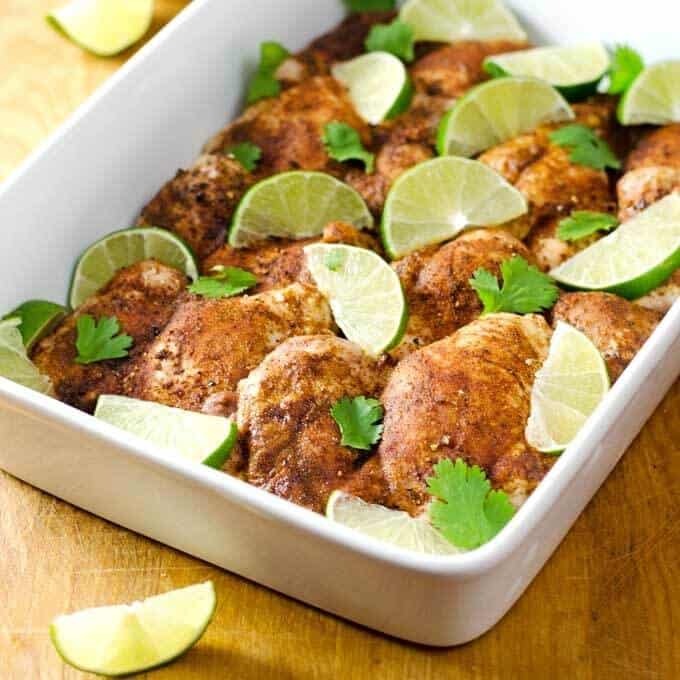 This is one of my favorite keto chicken recipes. The thighs cook surprisingly fast and they’re always juicy and delicious. The chili rub is made from my own blend. I love to serve this easy chicken dish with guacamole and of course, cauliflower rice. This is an easy and fast keto dinner the whole family will love. Prepare extra because you’ll enjoy the yummy leftovers too! Almonds and spices come together for crunchy, low-carb “breaded” chicken. This coating is perfect for chicken tenders and kids will love dipping the crunchy bites in their favorite sauce. This keto-friendly chicken recipe will please everyone, whether they follow keto, paleo or simply like a healthier take on crispy, crunchy chicken. 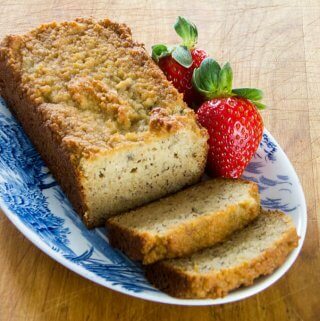 With only a few ingredients it’s a surprisingly easy recipe to make. I love roasting chicken because you get a flavorful, crispy texture that’s so delicious. These lemon chicken legs are roasted in the oven or on the grill. The extra crispy skin is full of flavor and really locks in the juice from your chicken (although, I’m sure the marinade is delicious on skinless cuts as well). Super simple, yet pretty enough to serve at a party, these baked chicken fajita roll ups are so easy. They’re baked in the oven and thanks to the marinade they’re juicy and flavorful. The pepper strips and onions add plenty of zest too. You’ll love these keto chicken roll ups. Perfect for a Tex-Mex dinner! Chimichurri sauce is an Argentinian specialty. 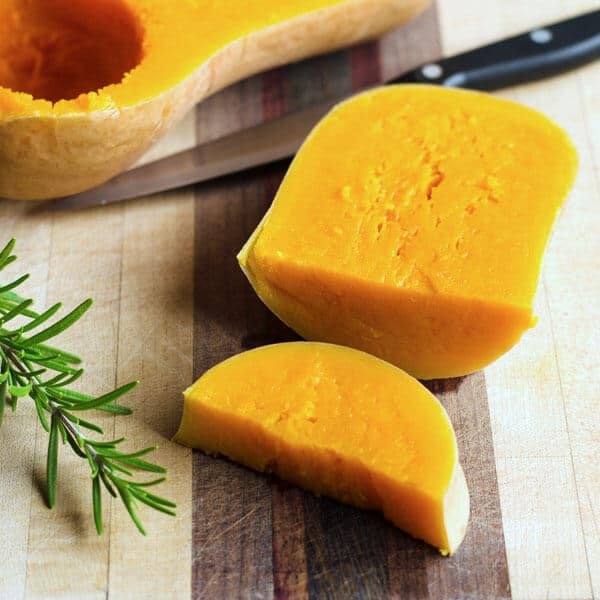 It’s also one of my favorite ways to add bright, fresh flavors to any grilled or roasted meat. Grilled chicken provides the perfect backdrop to this green, flavor-packed sauce. 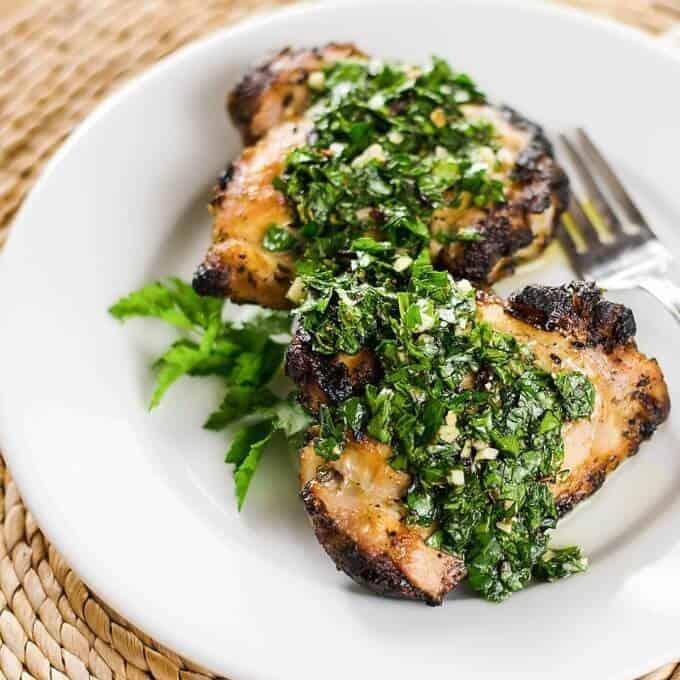 This is a wonderful summer recipe and the chimichurri sauce is perfect on fish, meats, and vegetables. Make plenty because you’ll want to use it all the time. On busy weeknights, there’s nothing better than an easy Italian grilled chicken breast. These are marinated in my special Italian dressing, which is keto and paleo-friendly. You’ll love the flavors, juiciness, and simplicity of these grilled chicken breasts. They pair well with a simple salad, some roasted vegetables or over zucchini noodles. The Instant Pot is wildly popular right now and for good reason. It cuts your cooking time down to a fraction of the regular time. While it does take trial and error to get used to cooking with the Instant Pot (or any pressure cooker), once you get the hang of it you’ll be amazed at what a time-saving tool it is. This recipe walks you through everything you need to know about using the Instant Pot to make delicious, succulent and tender chicken thighs in only 18 minutes! Jerk chicken is a Jamaican classic, referring to the way the chicken is grilled slowly. This recipe takes the flavors and spices typically used in the jerk chicken rub but simplifies the cooking process with a slow cooker. The results are a yummy, spicy and flavorful chicken dish. Enjoy this one with cauliflower rice or your favorite vegetables for a simple, delicious meal. Enjoy a delicious chicken dish today. These low-carb, keto chicken recipes will give you plenty of opportunities to add chicken to the menu, without getting bland or boring. Chicken is a perfect protein for everyone, whether you follow paleo or keto—or if you’re simply looking for great low-carb dinner recipes. 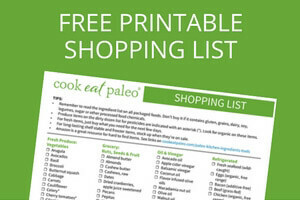 BONUS DOWNLOAD: Click here to get a free printable Keto Shopping List. So many choices—but the chimichurri is definitely one of my favorites!